Searchglobo.com is the PUP that uses misleading techniques to prevent removal. Use Reimage to locate malicious components and get rid of them faster than with uninstall instructions. A full system scan blocks virus reappearance and prevents traffic to malicious domains. How can I remove Searchglobo.com virus from my computer? How can I avoid this browser hijacker? 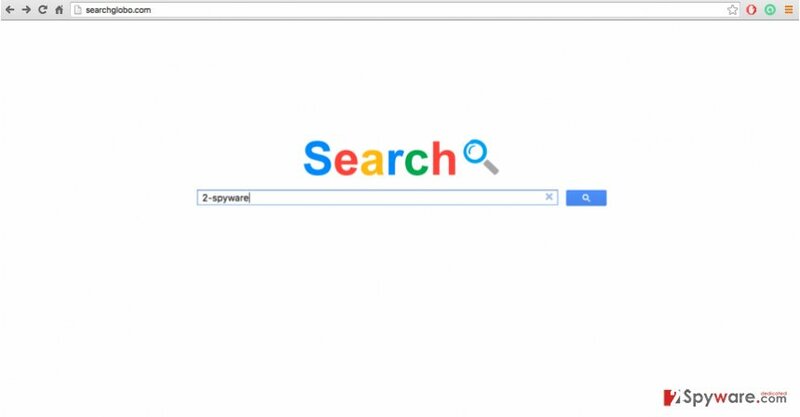 Searchglobo.com is a browser hijacker, which is very similar to Hightsearch.com, Searchemyn.com, Searchgle.com and similar search sites that are considered suspicious. As a rule, they spread in a bundle with free software and hijack each of web browsers, such as IE, Mozilla, Chrome and Safari. By doing so, they leave their victims incapable of using their previously-used search engines. In fact, these particular viruses have become especially popular in the last couple of years because they let their creators achieve quick and easy profit. The only thing that they have to do is to install their search engine and use it for injecting needed advertisements and sponsored links into its search results. These links are used for promoting the third-party companies and products, and earning the money from making them famous. Thus, you should not expect from Searchglobo.com virus that it will present you with useful results. Most probably, they will try to redirect you to sponsored websites that may be infected with other PUPs or viruses. If you decide to use the search engine anyway, you should also be aware of additional risks that are related to it. We must warn you that this search engine can track you behind your back, can slow your web browser and cause other problems on your computer. To know more about each of these risks, keep reading this article. However, if you, like us, think that it is better to remove Searchglobo.com from your device and choose a more reliable search engine instead, we suggest scanning your system with some reliable anti-malware utility, such as Reimage. This professional software will closely investigate your system and will not leave any potentially dangerous files behind. As we have already pointed out, having Searchglobo.com installed on your system can expose your system to a variety of risks and even lead to some very unpleasant consequences. We must emphasize that the program is not malicious itself, yet some of the activities it carries out on the infected computers can easily attract other malware and damage the computer. It can mostly be triggered by the Searchglobo.com redirect tendency. Because the search results this search engine displays are mixed with ads linking to numerous third-parties, there is very little control over the legitimacy and reliability of these sites. So, it is only a question of time, when one of such links redirects you to some infectious site. We should also warn you that browser hijackers are usually involved in data tracking as well. This means that by keeping such programs installed you voluntarily disclose what websites you are visiting, what pages you frequently view and what you look for online. Of course, you can easily stop this tracking by carrying out the Searchglobo.com removal as soon as possible. You can avoid getting infected with searchglobo.com by following a few simple rules. Stay away from unreputable websites, avoid interacting with suspicious ads or download random software, and always check the downloaded software for additional hidden components. It is quite simple. In the software’s setup, choose Advanced or Custom mode and carefully follow the upcoming steps. Make sure you unmark all the suspicious installs and proceed the installation with the program you initially downloaded. Nonetheless, do not forget to scan your computer with a reliable antivirus scanner regularly, in case some potentially unwanted program like Searchglobo.com has slipped through and infected your system. Searchglobo.com just like the majority of other browser hijackers can be very clingy, so even remove it from your computer, it can bounce back to your browser the next time you boot your computer. Usually, such undesirable recurrence is possible due to the so-called helper objects, i.e. additional browser add-ons which the virus arbitrarily installs on the computer to help it recover after the main files are deleted. So, to make sure the Searchglobo.com removal is successful, you must find these helper objects and delete them along with the virus. The quickest way to detect them is by running a scan of your system with an antivirus scanner. Alternatively, you can locate them one by one, following the instructions provided below. Here, look for Searchglobo.com or any other recently installed suspicious programs. Wait until you see Applications folder and look for Searchglobo.com or any other suspicious programs on it. Now right click on every of such entries and select Move to Trash. When in the new window, check Delete personal settings and select Reset again to complete Searchglobo.com removal. Once these steps are finished, Searchglobo.com should be removed from your Microsoft Edge browser. Here, select Searchglobo.com and other questionable plugins. Click Remove to delete these entries. Now you will see Reset Firefox to its default state message with Reset Firefox button. Click this button for several times and complete Searchglobo.com removal. Here, select Searchglobo.com and other malicious plugins and select trash icon to delete these entries. Click Reset to confirm this action and complete Searchglobo.com removal. Here, select Extensions and look for Searchglobo.com or other suspicious entries. Click on the Uninstall button to get rid each of them. Here, look at the Homepage field. If it was altered by Searchglobo.com, remove unwanted link and enter the one that you want to use for your searches. Remember to include the "http://" before typing in the address of the page. Now you will see a detailed dialog window filled with reset options. All of those options are usually checked, but you can specify which of them you want to reset. Click the Reset button to complete Searchglobo.com removal process. This entry was posted on 2016-07-04 at 02:24 and is filed under Stealing programs, Viruses. You can quickly scan the QR code with your mobile device and have Searchglobo.com manual removal instructions right in your pocket. How did you remove Searchglobo.com?